Check out the photos from the Diamond Comics/Previews booth at San Diego Comic-Con 2015. They had a ton of companies represented here. Some fantastic new reveals as well. I’ll try to break down the companies below, and add any major reveals with them. Toyark sponsor Entertainment Earth has supplied us with the figures, and we have a full gallery of the Funko Game of Thrones Legacy Collection to check out after the jump. In the time we have offered the Tyrion Lannister figure from the hit HBO® series Game of Thrones® for pre-order, a common question we have been asked is who will be next! Today we can officially confirm and reveal that the next figure in Threezero’s 1/6th scale Game of Thrones collectible figure line will be Lord Eddard of House Stark. As with our usual practice, we will offer Eddard Stark for pre-order at threezerostore.com for a limited time beginning September 15th 9:00AM Hong Kong time, with the exclusive bonus accessory ‘Ice,’ Eddard Stark’s greatsword. The standard release and Threezero exclusive release will both include his Stark cloak, additional hands, belt with sheathes, and his sword and dirk weapons. 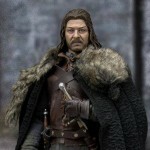 Game of Thrones Season 1 fan favorite Ned Stark, portrayed by the always awesome Sean Bean (and always killed), is getting the 1/6 scale treatment. ThreeZero has posted the first teaser photo for the upcoming figure. 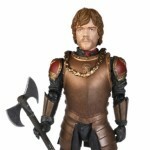 Ned Stark will join their previously released Tyrion Lannister figure. ThreeZero stated that the product is not final, and they are still working on the head sculpt and fine details. Expect more images, pricing and release info soon. See the preview after the jump. Funko jumped into the 6/7 Inch action figure game hard with a rapid fire announcement and release of Game of Thrones Legacy Collection Wave 1 this month. Right before Toy Fair, they dropped at Barnes and Noble stores first, with a wide release at retailers to come. Wave 1 consists of Jon Snow, Ned Stark, Daenerys Targaryen, White Walker, The Hound and Tyrion Lannister. Each has a varying range of motion and show accurate accessories. We’ve done up a gallery for all of wave 1, check out over 60 pics and some quick thoughts from the staff after the break! I will let you all in on a scoop, that is series 2 will be shown for the first time at Toy Fair. So you will see a New Daenerys(mother of dragons outfit), Khal Drago, Jamie Lannister, Robb Stark, Arya and Brienne! 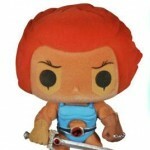 We’ll be at Toy Fair and will be covering these extensively! you can check out the new official images after the jump. Check out all the new Game of Thrones images after the jump, via an eBay auction here. Of note: This is also the first look at the highly detailed 6/7 inch figures from Funko. This now puts them squarely in competition with NECA, McFarlane and others like Marvel Legends and Black Series from Hasbro. They look good here and the Toyark staff eagerly awaits more shots of these and more licenses!